NEW DELHI: Indian opposition leader Rahul Gandhi filed his papers on Thursday to run for parliament from a southern constituency, aiming to strengthen his Congress party's prospects in a region where the ruling Hindu nationalists have a limited presence. Although surveys show Congress is trailing Prime Minister Narendra Modi's Bharatiya Janata Party (BJP) in the elections that begin next Thursday, the race is tightening. "I am here to send a message that south India is important," he told reporters as thousands of party members lined the streets of the small town in welcome. Modi's BJP has its core base of voters in India's north and west, playing second fiddle to regional parties across the south, except for Karnataka, home to the technology hub of Bangalore. "There is a feeling in south India that the way the government, RSS and Narendra Modi are working... many people in the country feel that their culture, language and history are under attack," he added. Kerala has a significant population of Muslims and Christians in a predominantly Hindu India. Muslims form nearly 27 percent of the state's population of about 33.4 million, and Christians roughly 18 percent, census figures show. The BJP denies bias against Muslims, but says it opposes appeasement of any community. Muslims account for 14 percent of India's population of more than 1.2 billion, which is almost 80 percent Hindu, census data shows. Gandhi is also running from Amethi, in India's most populous state of Uttar Pradesh, which sent his father, former prime minister Rajiv Gandhi to parliament, as well as his grandmother Indira Gandhi, another former prime minister. 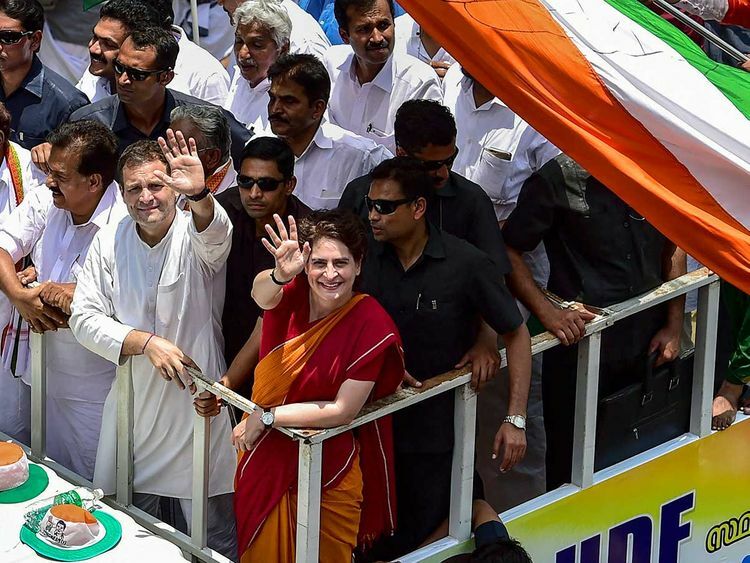 Congress General Secretary Priyanka Gandhi on Thursday carried the shoes of a journalist who collapsed when her brother and party President Rahul Gandhi visited Kerala to file his nomination papers for the Lok Sabha elections. Three media personnel fainted soon after Rahul Gandhi addressed the media after submitting his nomination papers at the office of Wayanad Collector. 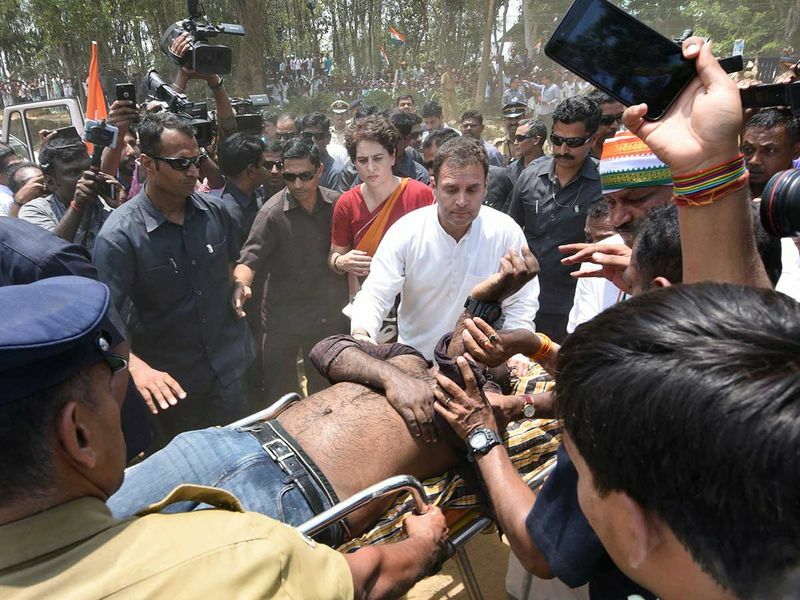 A video which went viral showed Priyanka Gandhi holding one of the journalist's shoes while Rahul Gandhi helped people carry the stretcher on which the man was taken to an ambulance. 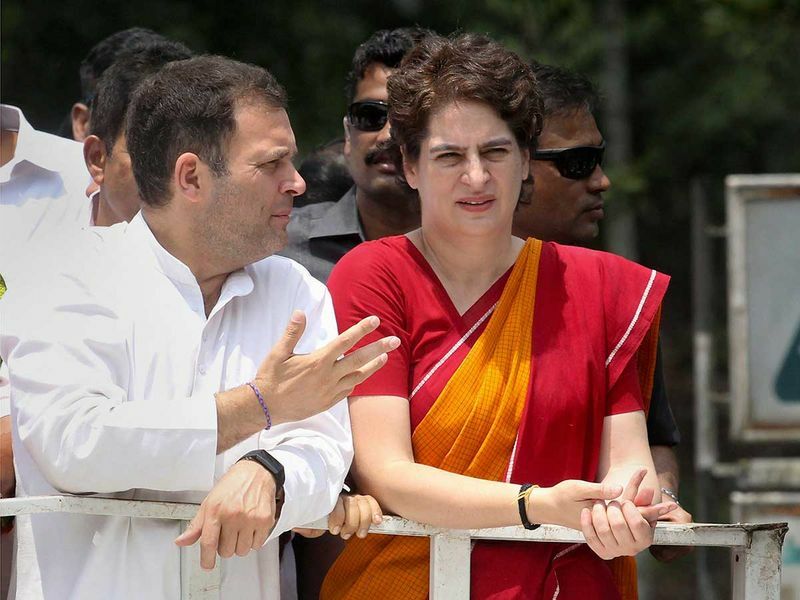 Congress General Secretary Priyanka Gandhi Vadra on Thursday urged the voters in Wayanad to elect her brother Rahul Gandhi from there in the coming Lok Sabha elections, saying that he will not let them down. "My brother, my truest friend, is by far the most courageous man I know. Take care of him Wayanad, he wont let you down," Priyanka said in a tweet. Wayanad, where Congress President Rahul Gandhi filed his nomination papers on Thursday for the Lok Sabha polls, is a popular tourist hub and also one of the most backward regions in Kerala. Located high on the Western Ghat, more than 850 sq km of the district is forested. Wayanad is also home to many indigenous tribal communities. Bordering Karnataka and Tamil Nadu, almost 50 per cent of Wayanad district's population is Hindu, with Muslims and Christians accounting for 28 and 21 per cent respectively. But despite a 89 per cent literacy rate, Wayanad is the least literate district in Kerala. It is considered backward compared to other parts of the state vis-a-vis infrastructure as well as educational and healthcare facilities. Also located here are the Edakkal caves with 6,000 year-old-rock engravings from the Neolithic age. The backwardness has not impacted the gender ratio. Wayanad boasts of 1,035 females to 1,000 males. Now, however, Wayanad has become better known as the constituency from where Rahul Gandhi hopes to enter the Lok Sabha. Carved out of Kozhikode and Kannur districts, Wayanad became the 12th district of Kerala in November 1980. According to the Election Commission, its total electorate is 13,25,788, comprising 655,786 men and 670,002 women. In the 2016 Assembly elections, the Congress-led UDF won the Sultan Bathery, Wandoor and Eranadu seats while the CPI-M-led LDF won Manathavady, Kalpetta, Nilambur and Thiruvampady. Wayanad became a Lok Sabha constituency in 2009, and senior Congress leader M.I. Shanawaz won with a margin of 153,439 votes, the highest victory margin in Kerala's 20 Lok Sabha seats. His victory margin dropped to 20,870 in 2019. Shanawaz died last year, due to a long standing ailment. Since then the seat was lying vacant. Taking on Gandhi is CPI's P.P. Suneer, a local. The BJP-led NDA has fielded Tushar Vellapally, Chairman of its ally Bharat Dharma Jana Sena (BDJS).